Today I am posting information from the Alzheimer’s Society UK website, on risk factors for dementia. Research has identified many risk factors associated with dementia. It’s impossible to eliminate every single one; after all we can’t avoid age, which is the most significant. Medical conditions such as diabetes, stroke and heart problems, as well as high blood pressure, high cholesterol and obesity in mid-life, are all known to increase the risk of both Alzheimer’s disease and vascular dementia. Anyone can reduce their risk by keeping these under control. Depression is a probable risk factor for dementia; getting it treated early is important. Isolation is also another risk factor. People who adopt a healthy lifestyle, especially from mid-life onwards, are less likely to develop Alzheimer’s disease. This means taking regular physical exercise and keeping to a healthy weight, not smoking, eating a healthy balanced diet and drinking only in moderation. Leading an active lifestyle that combines regular physical, social and mental activity will help to lower risk. Research has identified many risk factors associated with dementia. It’s impossible to eliminate every single one; after all we can’t avoid age, which is the most significant. However, there are things that could affect the risk of developing dementia that we may be able to change. The image pictured above, and which you will find if you follow this link represents a brain and some of the things that affect its health, in good or bad ways. It looks at what the current evidence says in terms of how they may be related to the risk of developing dementia. It is worth having a look as it brings up the relevant information relating to which part of the brain you want to investigate. The image does not have that capacity here.. Overall, try to lead an active lifestyle that combines physical, social and mental activity. Not only will it help to reduce your risk of dementia, you’ll hopefully enjoy life more as a result! I was told recently by my GP that studies (or at least one study) has shown that crosswords don’t stop mental decline, and that social engagement is the best thing older people can do to delay mental decline. 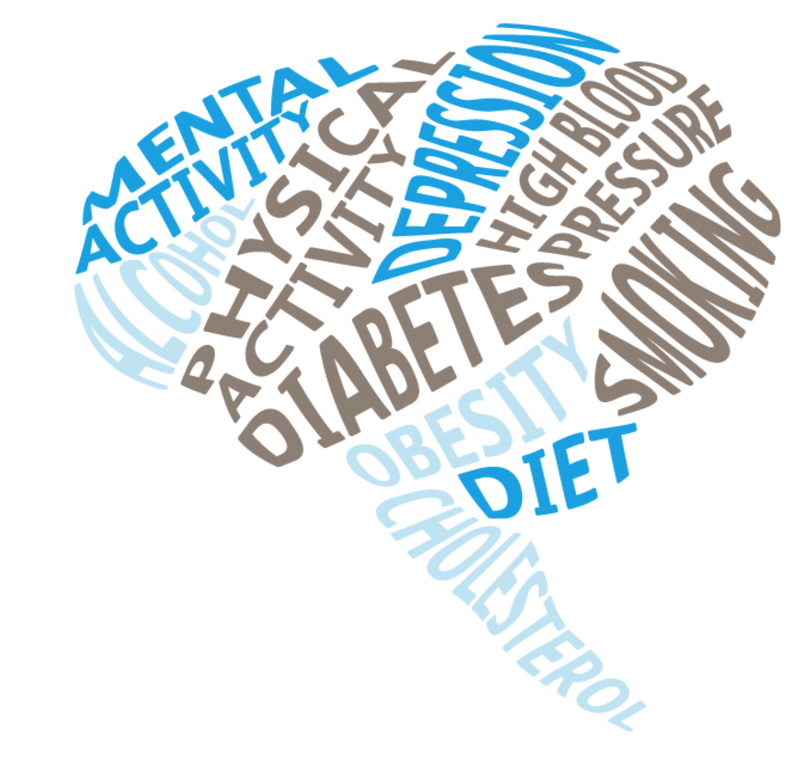 At a research forum recently, it was announced these few things are risk reduction factors in dementia; 1. lifestyle changes, e.g. managing BP, cholesterol, diabetes and obesity, 2. Physical exercise, 3. Mental exercise, in particular NEW learning (so if you’ve never done crosswords, and find then challenging, they would be helpful), and reducing isolation. Very informative as usual Kate. Good read. The risk factor of high blood pressure is really relevant for Maureen. What an irony the her blood pressure has been fine since stroke. It puzzles me that they didn’t suspect TIA’s years ago when I look back at the symptoms she was presnting to medics. Talk about ‘shutting the gate after the horse has bolted’. Exactly! I suspect very few of us worry too much about the risk of any health issues, until it is TOO LATE!